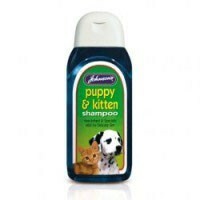 Johnson’s Puppy and Kitten Shampoo is a specially developed, gentle formula for use on delicate skin. This mild shampoo is perfect for bathing your pet after a good day of exploring! Supports the development of a beautiful coat and leaves them clean and smelling fresh. A great start for your puppy or kitten!